Sometimes you find a Public Enemy CD in a dollar bin, and when you see that it has Masta Killa on it, you buy it. After hearing the "For What Its Worth"-biting title track (or maybe seeing the video) when this came out, I didn't have much desire to hear this record. I always thought that beat was insipid and lazy beyond all measure, and coming from PE it seemed way worse. If they were trying to make a cash run, I guess I can't fault them for that, but still: it just didn't seem like something they should be doing. Turns out that's one of the weaker tracks on this record, and the rest of it, while not mind-blowing, isn't too bad. The track with Masta Killa ("Resurrection") was dark, fluid beat, and even though Masta sounds like he's rapping through a telephone, hearing him and Flavor Flav on the same song is bizarrely cool. Some of the songs on here must be movie-specific, because otherwise I can't make any sense of the mess that is "Shake Your Booty." This album came out around the time that PE was clearly having trouble finding their place in modern music, and you can hear some of that, but this thing's definitely not an awkward stinker. But do I listen to it all the time? Nah. But I should probably get to know it better than I do. 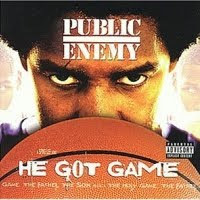 My Public Enemy game just ain't what it should be, I'm afraid.